Probably one of the simplest and most delicious ways to enjoy halibut – in season right now. Start with halibut from a great fishmonger – well worth it. 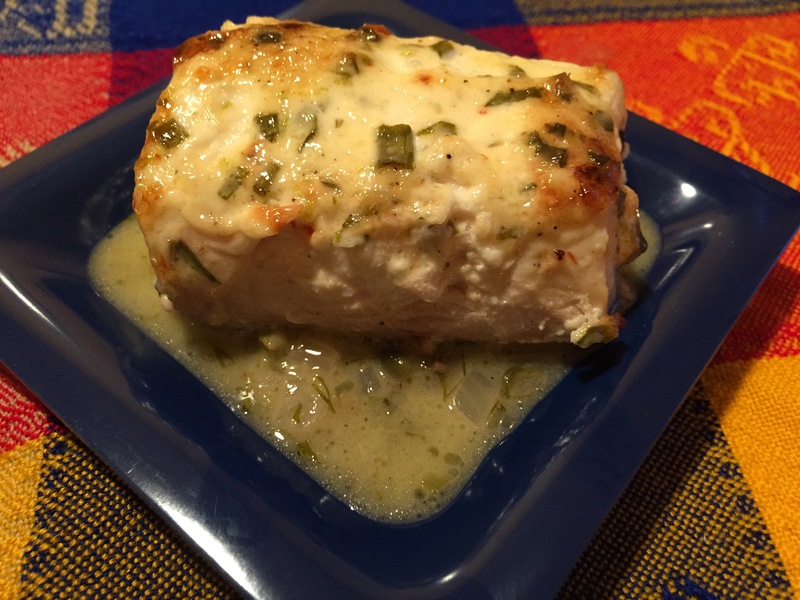 Moist, flaky and delicious halibut served with Caper Beurre Blanc. In small saucepan simmer the shallots, wine and vinegar until reduced by about half. Add butter one piece at time, whisking well until smooth and creamy looking. Keep warm until you are ready to serve halibut, adding capers and dill right before serving – just until capers are heated through. Blend the mayonnaise well with all the ingredients. Spread over the tops and sides of the halibut. This can be done earlier in the day, and allowed to rest in the fridge. I’m not a huge fan of recipes that have fish or chicken slathered in mayonnaise – this allows the flavours of the halibut to work beautifully with the herbs and is enough to keep the fish moist. Feel free to add more mayo though if you like. Bake halibut in 400 degree oven for 15-20 minutes, depending on how thick the fillet is. Watch carefully after 15 minutes. The minute your fish starts to flake easily it is done, so remove it from the oven. Serve with Beurre Blanc sauce – simple white rice is a great carrier for the sauce. We served it tonight with some of the first of the seasons carrots and asparagus, along with fresh garden greens – but I wasn’t fast enough to get a photo of the completed plate! This entry was posted in Recipes and tagged basil, beurre blanc, capers, dill, fish, halibut, herbs, main dish, parsley by Chatty Kathy. Bookmark the permalink.